When “free” isn’t quite “free”. Or, remember to read the fine print on online photo sharing sites. A quick comparison of some online photo sharing sites. I have been a happy user of Flickr (I use the “frugal” account) till yesterday when I got a big pop-up box about a 200 image limit. Apparently flickr does offer unlimited free image storage but the fine print says that only the most recent 200 can be shared. Not the worst thing in the world but I began to think of all the other things I did not like about Flickr and so I started to look around and see whether I had some other alternatives. There are any number of online image sharing sites. Many of them are also linked with photo printing services, and arguably that is where the money is. It appears that the devil is most certainly hiding in the fine print. Here is a short summary of what I found. I’m planning to move to Shutterfly; do you have some experience with them which makes this a bad idea? storage. No more than 200 can be shared at a time. There are upload limits on the number and size of pictures that you can upload. Unlimited upload, storage and high resolution storage. Free account has limited (modest resolution) images. Free unlimited storage of pictures. Images stored at high resolution. But you cannot download at high resolution. Personalized web portal. make one purchase a year. resolution images is not free. No paid offering that I could find. No ads! 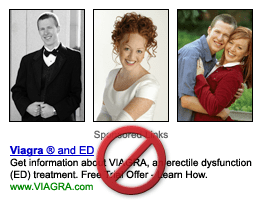 Now, isn’t this a great graphic to illustrate the success in targeted advertising and reinforce their point? No free offering. There is a 14 day free trial. Free high resolution image downloads. galleries and sharing stuff. Go here if you want serious prints. What BS is this? I guess I’m going to stick with Flickr for a while longer. further info on “active” user at snapfish. They offer free prints or prints for pennies from time-time. When my “inactivity” came up, I used the freebie they gave me and retained my “activeness”. Agree that the free storage option is pretty pitiful. Nevertheless you can add more. When you “upgrade” to paid storage on your Google account the storage is shared across all Google services, including Picasa. The big attraction for using Picasa is (of course) the desktop tool which is very good indeed and nicely integrated into the online service. There are various sites which are providing the facility of sharing pictures but most of them after certain time charge money for their services. Next Next post: OpenDNS and paid wireless services.